Hard to believe that it is already June! The school year is coming to a close and the glory days of summer are quickly approaching! 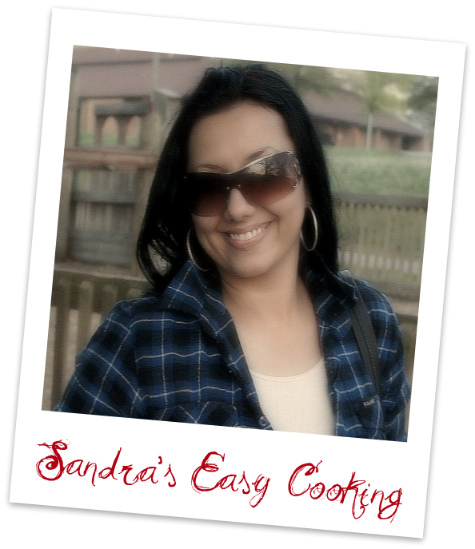 I’m thrilled to introduce you to Sandra of Sandra’s Easy Cooking as this month’s Top Mom. Many of you probably know Sandra from the comments she leaves on your posts. She tirelessly visits countless blogs in support of her fellow foodies and her energy and positivity seems to have no bounds. Sandra has worked in all the areas she dreamed of: photography, fashion design, chef, artist, and teacher. Twelve years ago she met her husband and fell instantly in love and she’s more in ♥love♥ than ever after 11 years of marriage! She considers being able to stay at home with their three children to be the greatest gift she could ever receive. When I discovered that Sandra came to the U.S. from Yugoslavia, I asked her if there was a special dish that her mom used to make that she could share here. We’re so lucky that one of the things that Sandra fondly remembers from her childhood are cream puffs :-), which she just recently learned to make! So here’s a gift from Sandra’s kitchen to yours! When all the eggs are incorporated put it on the side. Body: round tube (2/5 inch) to push them out in a un-greased baking pan. Spray the puff shells with water. The puff shells will stop growing as soon as the surface turns dry (and crunchy). Therefore, when spraying the puff shells with water, it takes more time before they turn dry and they grow bigger in the oven. Bake but DO NOT OPEN the oven for the next 30 minutes +20 min. to dry. The 20 minutes are needed to dry the surface of the puff shells and make it more crunchy. Otherwise, it is too soft. The puff shells look well done after 30 minutes already… that’s normal. I let them rest in the turned off oven for 20 minutes and than 10 more minutes out of the oven. Cut them and fill when they are cooled down or like did here just insert pastry bag to pipe the filling on the bottom of the cream puff shell. Mix 3 cups of cold skim milk(fat free) with large vanilla pudding, about 2 minutes until it forms. Add 4 Tbs. Of Whipped Cream and combine well just by folding. Put it in the fridge! *I added 1 teaspoon of the fat free whipped cream on top of the pudding, but it optional. Also you can toss some powdered sugar or chocolate rind on top. Can you believe how luscious these puffs are? Even for someone who doesn’t have a sweet tooth, I find these irresistible! For more instructional photos on the cream puffs and other fabulous family-tested recipes, take a minute and visit Sandra’s Easy Cooking. Yes, Sandra is a special person and I highly admire of her. The cream puff is my husband’s top3 desserts, and I told him I don’t know how to cook it, but now I guess I have to give it a try. It doesn’t look too easy for a non-baker like me, but I’m willing to try for some special occasion. Thank you for sharing the beautiful and delicious treats. And I’m first time here and glad to find this website. Just started to follow you on facebook & twitter! These cream puffs look picture perfect, scrumptious treats! Oh my my my… I would looooove to just bite into one of those cream puffs!! They are gorgeous! 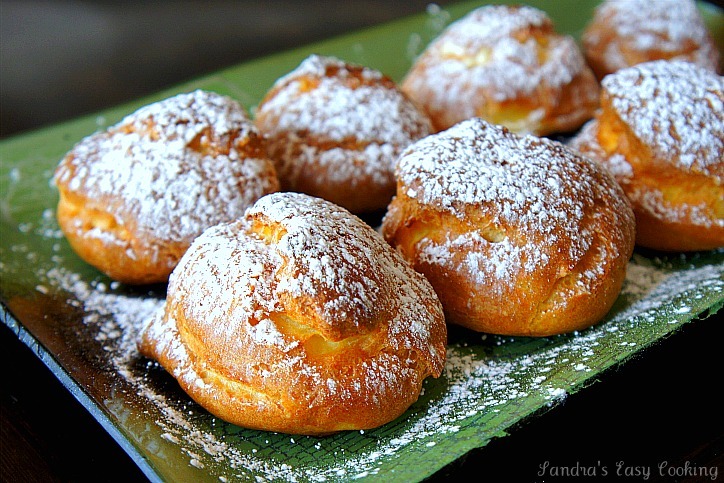 I have drooled over Sandra’s food photos many times and am going to drool over these beautiful puffs too! Lovely! Came over from Sandra’s site, and I love all the things she whips up. She is incredible! This cream puff post just proves it… They look amazing and delicious! Congrats, Sandra! I adore cream puffs! We have them in Iran, too. Did we are steal them from the French? Gorgeous picture! Congrats to Sandra! What a nice post about her. I enjoy her blog very much. Always great recipes, like this one, and beautiful photos! Amazing! I find Sandra and her blog really amazing, and I’m truly her fan! She’s perfect to be She’s Cookin’s Top Mom for this month!!! Her cream puffs are so mouthwatering just like all of her other creations! Oh! I luv cream puffs and these look dreamy. I’ll take a dozen please! Thanks for sharing and introducing Sandra…I’m headed over there right now! Wonderful recipe and do they ever look yumm! Sandra is one of the kindest people you’ll wever come in contact. She makes herself available to share her blogger wisdom at any time. It’s been an absolute joy getting to know her. Not to mention those awesome recipes and pictures! Love Sandra’s Blog – she is a Top Mom for sure! These cream puffs sound delicious! Priscilla, thanks for sharing one of my favorite bloggers…these cream puffs look outstanding!!! Sandra, you are definitely a top mom…and a maker of exquisite desserts! Wonderful guest post!!! I’d love a whole plate full of these! Sandra, those cream puffs look heavenly! Thanks, Priscilla, Sandra, for this wonderfully delicious guest post! I didn’t know Sandra was from Yugoslavia! Awesome! 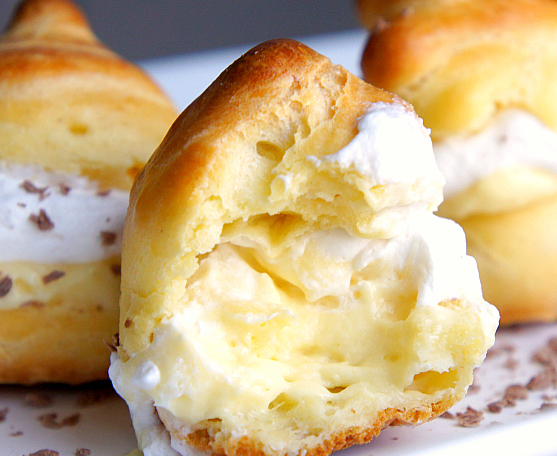 Gorgeous cream puffs. I love both your sites. Sandra – you are just a sweetheart. We all love you! I feel so honored to have “met” you. I especially love your heart for your children. I feel the same way- blessed to be able to stay home with my young children. You keep rocking these posts by the way! I am so very very proud of you for this honor on She’s Cookin.! Congrats Girl! Great to know even more about Sandra, I’ve loved visiting her for a while now. But when we do meet, I’m going to expect those cream puffs. Mmmm. It was my pleasure having Sandra here and gazing at her gorgeous creampuffs! @ApronAppeal – I’m glad you found me through Sandra, too. Let me know how the kebabs turn out – besides being easy to make, they’re delicious, colorful and fun to eat! Sandra is a woman of so many talents. I love it when she visits my blog and leaves her kind comments. I love her cream puffs. Look at those. One of my absolute favourite desserts. Lovely post, I am trully a fan of Sandra’s blog, her blog is amazing! 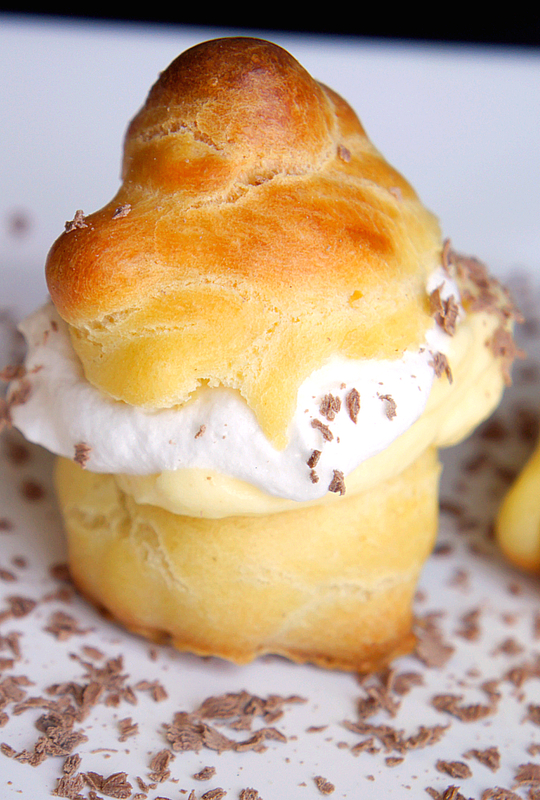 These creampuffs look absolutely delicious! Sandra is the best, no question about it! We love her blog, and her recipes, and that fact that she is simply a sweet and lovely person. Sweet and lovely, too, these cream puffs! Thanks for sharing Sandra with us all! Not only is Sandra a Top Mom, she’s also a Top Blogger, Top Wife and Top Friend! You can tell she’s one of my absolute favorites and you’re right, she’s tireless, immensely kind and her recipes are to die for! I mean, look at these lovely cheese puffs ;-). Wow! Those cream puffs look so yummy!! Cream puffs. I feel my pants getting tighter already! Totally worth it though! I don’t add sugar to the cream puff dough. That way, you can fill the puffs with sweet OR saviry fillings. Excellent appetizers when filled w/egg, tuna or ham salad and delectable dessert when filled with fruit or custard and whipped cream.